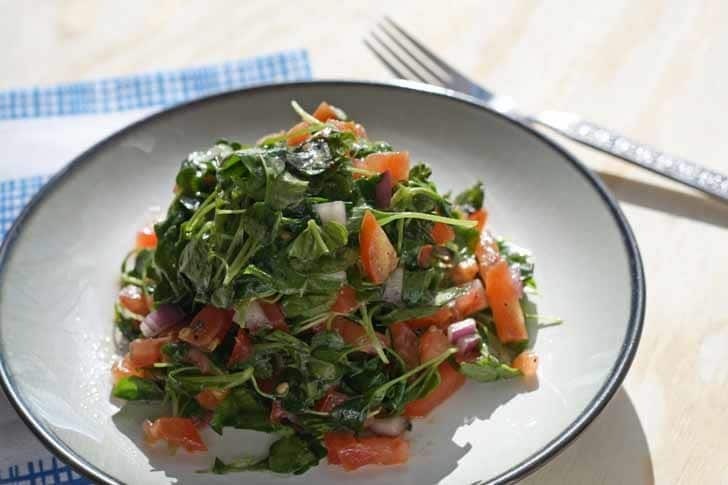 This baby arugula and tomato salad is perfect on its own, or on top of chicken or steak! Vegan, gluten free and paleo. 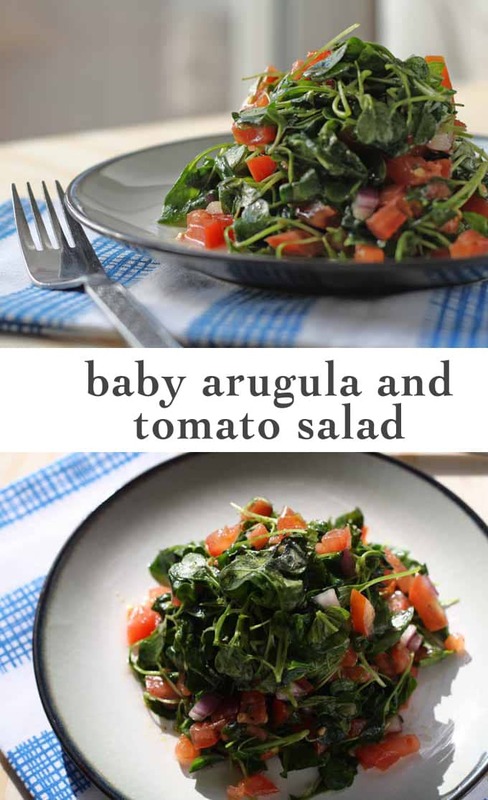 When I planned out my recipes for the week, I did not plan to make a baby arugula and tomato salad. But when I found a huge package of local baby arugula, I immediately added “something with baby arugula” to my list of recipes for Tuesday. Seriously, I have an addiction. Have I mentioned my arugula problem? I touched on it a little in this post but didn’t go into a lot of detail. It all started on my trip to Poland over the summer. It was surprising how many restaurants there served dishes with arugula in them. It was hilarious at first – all the menus were translated into English and we couldn’t figure out what “rocket” was. We had it first on a pizza and lo and behold…Arugula! !…it was sooo darn good. When we returned home, I found myself noticing arugula on a lot of menus here too. Maybe it was just because I realized I really liked it, I’m not sure. I have even noticed when other people talk about it. A girl I went to high school with is of Italian decent, and she joked on Facebook that her parents carry bags of arugula in their pockets and purses to add to dishes at American restaurants. I don’t know if all Italians do it too (anyone know if it is just a strange thing her parents do?) but I am seriously considering placing a little baggy of arugula in my purse when I go out to eat. Luckily, American restaurants are getting on the arugula train with me. Just a few weeks ago, I ordered an omelet when I was out for book club brunch, and next to my omelet was a heaping portion of it. I enjoyed the omelet but it was definitely the arugula that made my day. (affiliate link). Seriously guys, get this book. It has a lot of helpful cooking tips and some great recipes. Combine lemon juice, olive oil, salt and pepper. Stir in the tomato, basil and onion. Cover and refrigerate for at least 30 minutes. 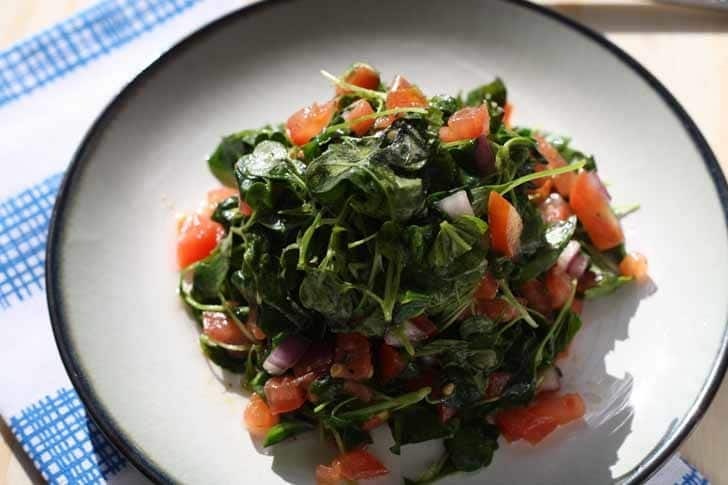 Just before serving, add the arugula, toss and serve. 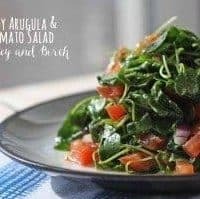 I hope you enjoy arugula as much as I do, because then you will love this salad. And hopefully, I will be a little more “here” this week. I will update everyone on why I’ve been so scattered soon – it is proving to be a hard post to write at the moment. ha! I love arugula, I may have to bring my own! BYOA! Lol, I love that. Going to create the hashtag #BYOA. 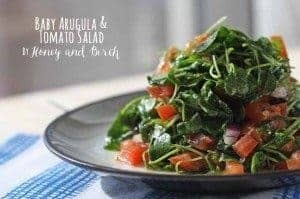 I just love, love, love arugula! I tried growing it but was not successful but now it seems to be much more easy to buy in the stores so I’m in luck! Great post. I am going to try to grow it this spring I think – I can never get enough of it! This salad looks fantastic! I can’t wait till tomato season. I have a bit of an arugula problem too. 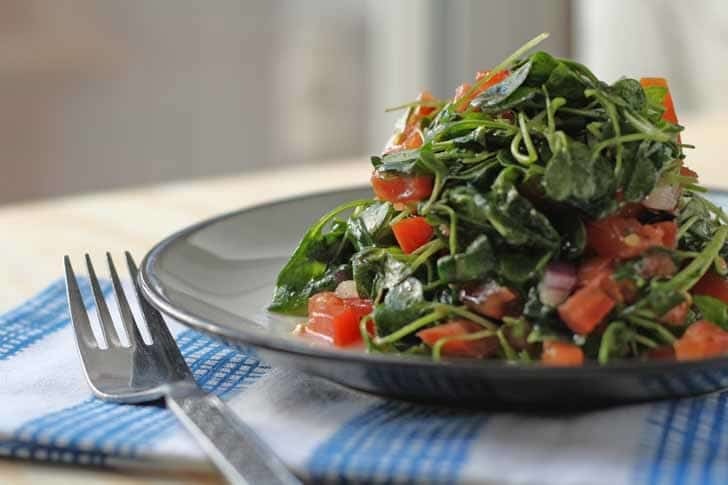 Not as bad as my baby spinach problem, but still… This looks like a yummy salad to add to my rotation! Oh boy, I had better stay away from baby spinach, lest I get that problem too!